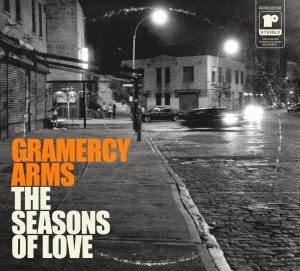 Gramercy Arms is a revolving cast of well-known artists based in NYC and led by Dave Derby, who spent time with Dambuilders and Lloyd Cole, among others. Their second album is The Seasons of Love. Cole is in the cast here, along with Joan Wasser (Joan as Policewoman), Doug Gillard and Kevin March of GbV and Tanya Donnelly, to name just a few. While the large cast does bring some variety to the sound, Derby's done a great job of tying it all together. The general approach is very upbeat and poppy, but this cast has the talent to make upbeat, poppy music that sticks. Here's the lead track, "Always In Love" - a bouncy, guitar and piano approach with horns scattered throughout back Derby's just-right vocal. For most of the song, he sounds just tremendously cynical and burnt-out, but at the end he reveals his real desire. Hey, that's the first step, right? Other highlights include "Winterlight", which is as light, airy and catchy a song as you will hear this year, and "Novemberlong", which features some terrific vocal harmonies throughout and is propelled nicely by piano on the beat with the drums (and more of those bright-sounding horn parts throughout). There are some pretty ballads, too - "Playing With Fire" calls to mind that great collaboration of Ronnie Lane and Pete Townshend, Rough Mix. And the title cut has a Brazilian lilt - ethereal vocal harmonies over a gently rocking Latin rhythm. I could keep naming songs, but I'd be saying the same thing. They're all well-written and very well-realized. The Seasons of Love is out now (July 22, 2014) on Reveal Records. It's a terrific pop record - perfectly suitable for driving, or just walking on a sunny day.